For the watercolorist, we’ve partnered with Silver Brush to bring you a new, custom Black Velvet brush set…amazing capillary action meets unbelievable control to produce one of our favorite brushes. The versatile Black Velvet is unique to any other brush on the market; they hold an enormous amount of water, yet release it with excellent control. This Wet Paint exclusive set will allow you to experience the brush that we – and well-known artists the world over – feel is an indispensable tool for the watercolorist. Categories: This just in! New products we are excited about | Tags: Black Velvet Brush, holiday catalog, Liz Carlson, Only at Wet Paint, Silver Brush, Wet Paint St. Paul | Permalink. 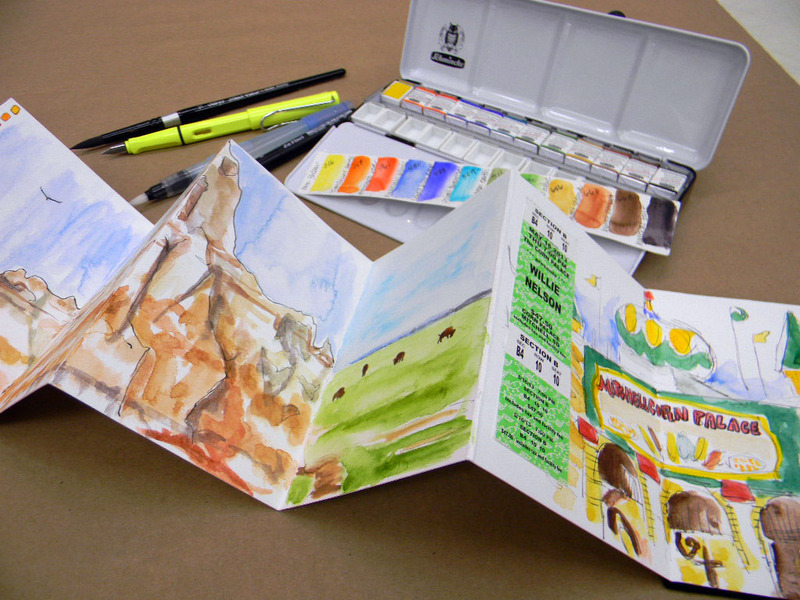 Summer Session is the perfect time for you to take your sketchbook out on Art Dates! It’s time to finally get outside and soak up the sunshine and fresh air and we’ve got lot of suggestions for outings that are sure to spark your imagination and awaken your creativity. Best of all, these exercises give you the chance to be completely in the moment as you enjoy the sensory stimulation of drawing outdoors. Not ready to sketch while you’re out and about? We know it can be intimidating to draw in public, but there’s no need to forego Summer Session – A quick snapshot on your phone and a few notes jotted in your sketchbook are a great foundation for sketching projects to tackle when you get home. We want you to enjoy your summer adventures, so we’re giving you two weeks between each Summer Session Art Date. With more time in between, you won’t feel rushed to get these done. Summer Session and our first Art Date will start next week! Stay posted for details and, in the meantime, catch up on your workouts and check out our Summer Postcard Project (see below)! 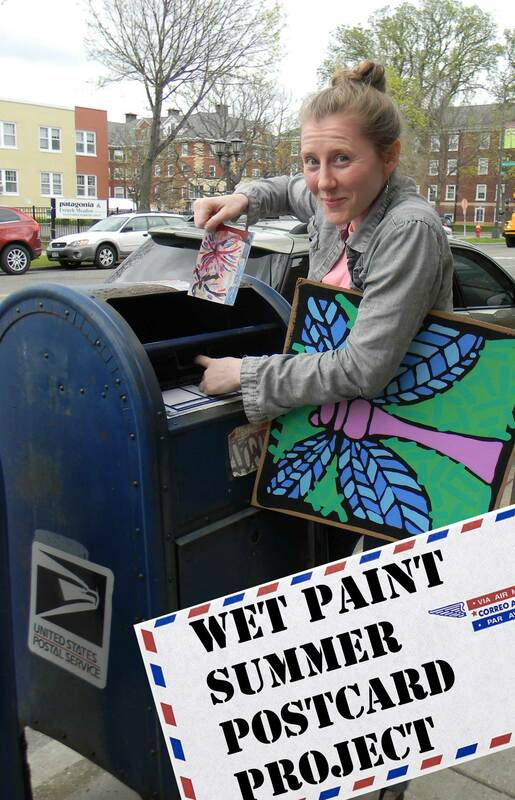 Fellow Wet Paint staffer, Langhan, getting excited about sending mail art! There’s no limit to how many postcards you can send, but in order to participate, postcards have to arrive at Wet Paint via our friendly postal carrier – – no dropping them off at the store! Don’t forget to sign your postcard(s) and let us know how to reach you. We want to make sure we’re crediting you when we post the work online and we want to be able to contact you with details about the end of summer art opening. Looking for ideas? Check out the Postcard Travel Kit that Liz and Kristina put together for this project. See below for more info. -In order to have your postcard displayed in our end of summer exhibition, you’ll need to have it postmarked by August 8th, 2014. More info about the end of summer exhibition and opening to follow. Categories: News, Wet Paint Weekly Workouts | Tags: Albrecht Durer Pencils, art supplies, Faber-Castell, Liz Carlson, Pentel Aquash, Postcard Project, Strathmore Postcards, Wet Paint St. Paul | Permalink. Draw something sight-sized! Make it small or make it large. Fill up a page in your sketchbook or just use the corner. Example image found on the internet from James Sayer (and what a lovely pencil shaving it is!). How about a cup of pencils or brushes? What about a piece of fruit or that sprouting onion? Maybe your watch or a favorite piece of jewelry? Whatever you choose, either go in close to draw all of the details or pan out and make it tiny! We suggest using the Tombow Irojiten colored pencils (Liz’ favorites!). Usage suggestion for colored pencil (since they are tricky to erase): start with light to dark values and soft to heavy pressure. 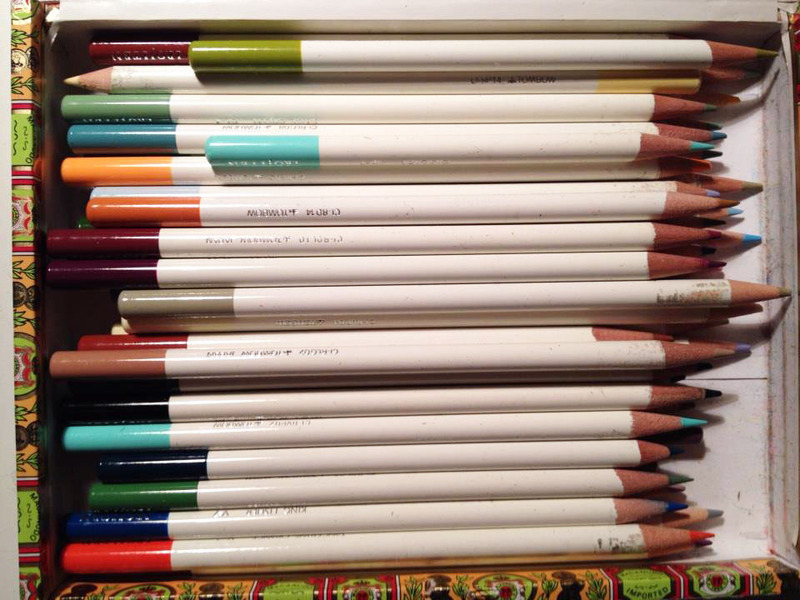 Liz’ stash of Tombow Irojiten colored pencils! Liz loves the Tombow Irojiten colored pencils because they blend and layer without heavy build-up, the points are durable and strong enough for writing, and best of all, they’re so pleasing in the hand (and on the eye)! This week only, April 2nd thru April 8th, Wet Paint will be selling them on super sale for 35% off MSRP! Time to stock up (Liz says she’ll share!) Click here to check out the entire line! Categories: Wet Paint Weekly Workouts | Tags: art supplies, colored pencil, Irojiten pencils, James Sayer, Liz Carlson, Tombow, Week 7, Wet Paint St. Paul | Permalink. Take a stroll, look out the window, and paint the town! Using the gorgeous Claude Monet pastel painting as inspiration, build, blend, and form your surroundings with smooth chalk pastels. Don’t think of this workout like a drawing exercise, but a chance to blend color and build layers as a painter would. We suggest using PanPastels because they take the mess out of traditional chalk pastels by putting it in a convenient cake format. It truly feels more like painting than drawing since you are using your fingers, paper towel, or the handy Sofft Tool applicators. Blank white page jitters? Try toning down the paper first with a light application of a neutral color (or your favorite color) using a large Sofft art sponge. 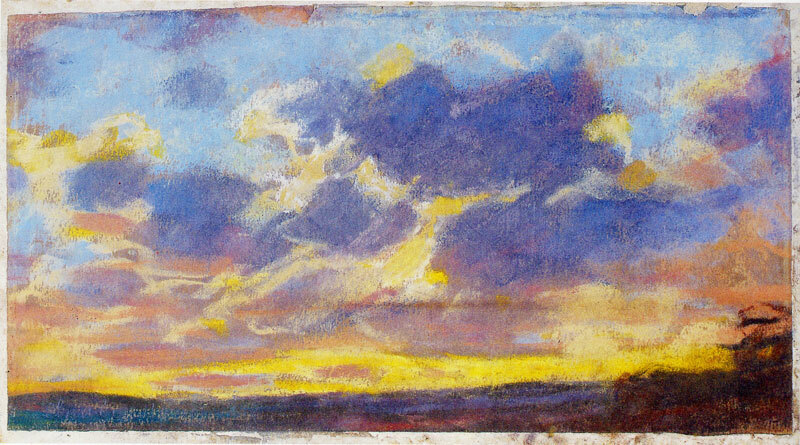 The PanPastel colors are brilliant, clean and blend beautifully. Each pan contains 40% more color than an average stick pastel, and without the waste from chalk dust and crumbling sticks there’s even more product for you to use! Try these with the Sofft Tools and you’ll never look at chalk pastels the same again! 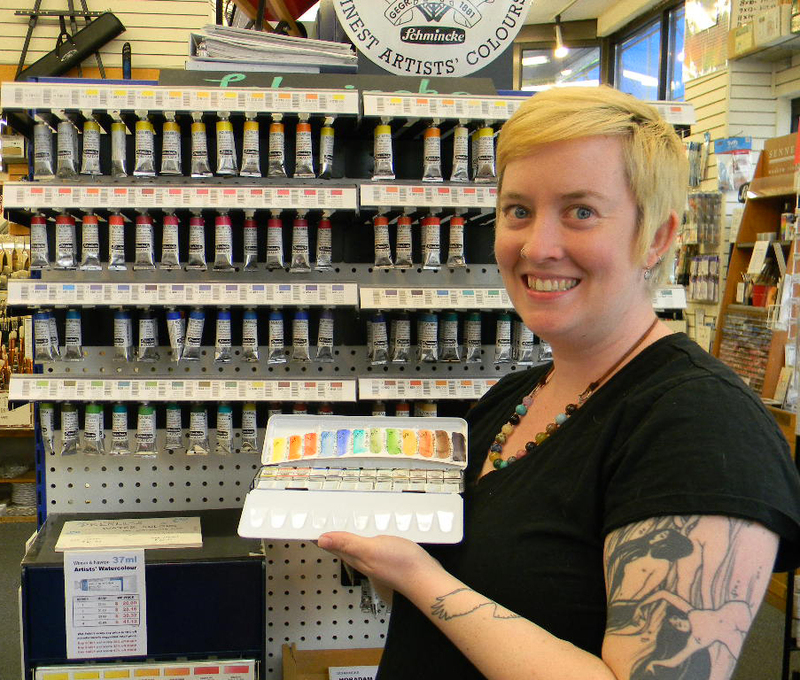 Right now at Wet Paint, you can get the PanPastel sets for 15% off our everyday price and individual colors are buy 2, get 1 FREE! Click here to see all our PanPastels! Categories: Wet Paint Weekly Workouts | Tags: art supplies, Claude Monet, landscape, Liz Carlson, Make Your Mark Sale, PanPastels, pastels, Wet Paint St. Paul | Permalink. Time to bust out your brushes and watercolors and dip into abstraction! 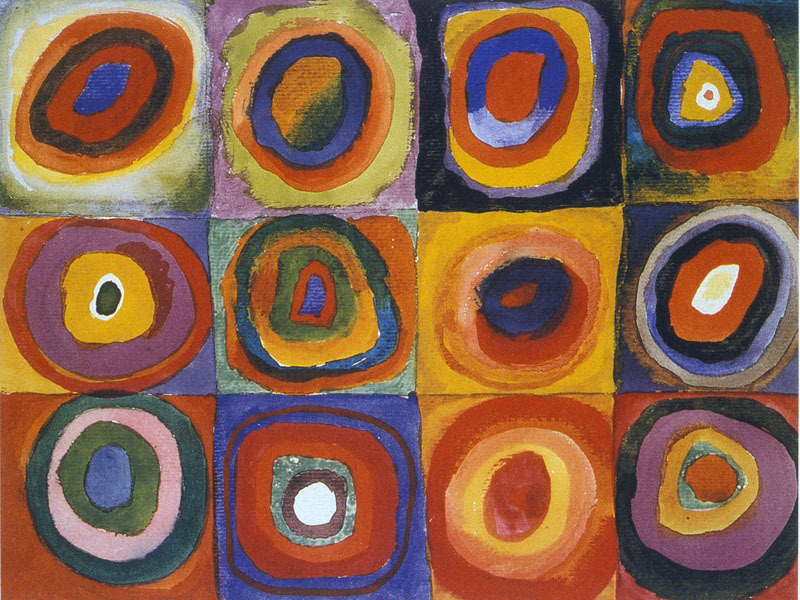 Try a simple pattern of shapes and colors (like the gorgeous Kandinsky circles shown here) and experiment with wet and dry techniques- or both! 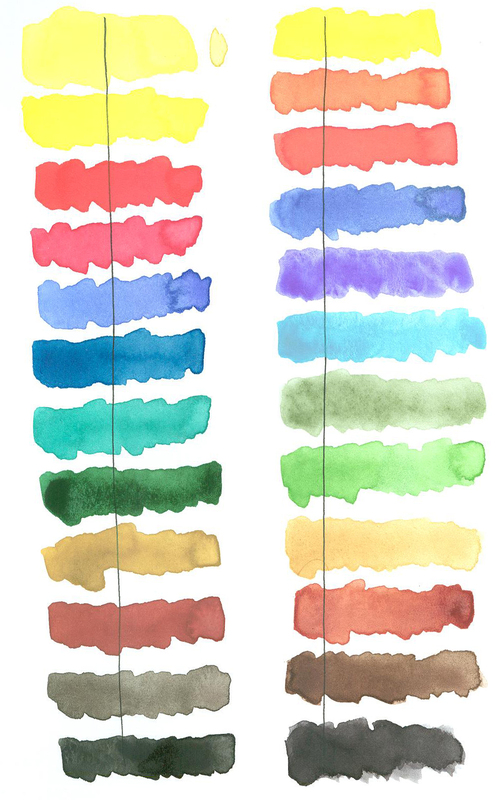 For example, try wetting the page with water before applying your color, or blot your brush after loading with color and drag it across a dry page. Blend techniques and see what happens! We are using a limited palette of colors (see below for more info), but you can use whatever colors appeal to you. And, don’t feel like you’re going in circles- maybe try squares instead! 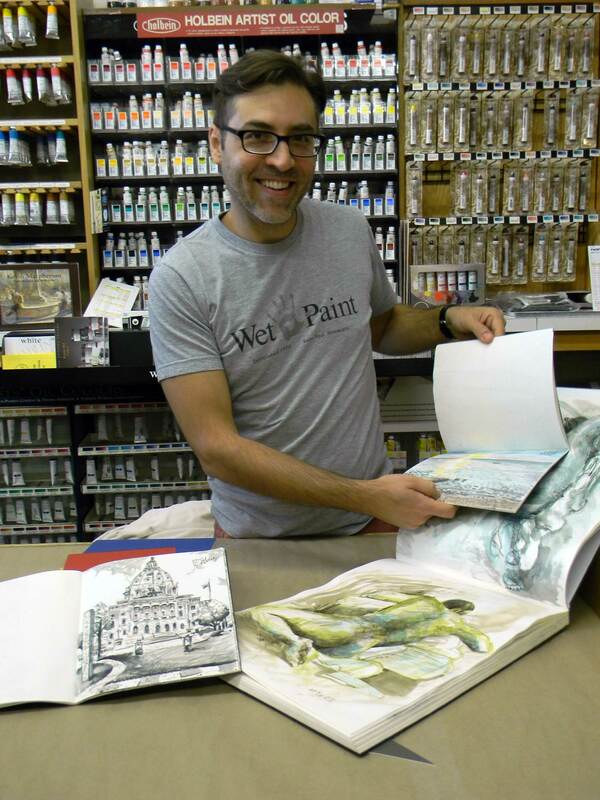 Everybody loves Daniel Smith watercolors (in fact, Wet Paint was the first store to stock them in the Midwest). 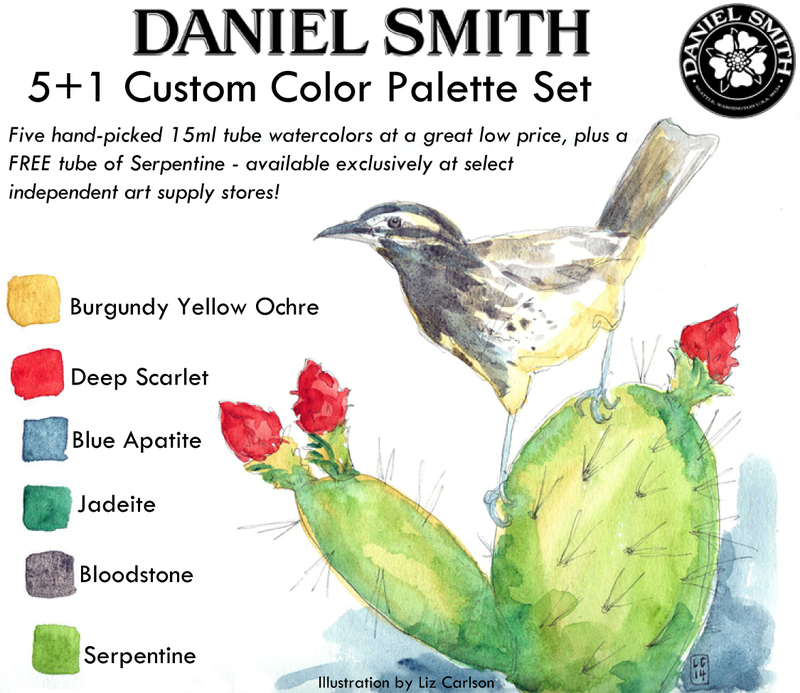 Wet Paint staffers, Liz Carlson and Kate Katzer, had the pleasure of selecting a unique palette of Daniel Smith watercolors for this exclusive, limited edition set (Liz also created the lovely Cactus Wren illustration on the label). The colors included in this custom set are: Blue Apatite, Burgundy Yellow Ochre, Jadeite, Deep Scarlet, Bloodstone, and a FREE tube of Serpentine Genuine. This selection of colors would be an exciting addition to any watercolor palette- landscape/nature or portrait painters will love it (but who wouldn’t?)! This set has a MSRP value of $135.18 (5 colors + free Serpentine) for $65.17 which equals more than a 50% savings! Click here to purchase! Already got these colors? Good news, all Daniel Smith watercolors are 40% off MSRP! Click here to check out the entire line! Categories: Wet Paint Weekly Workouts | Tags: abstract painting, art supplies, Daniel Smith Watercolor, Liz Carlson, Wassily Kandinsky, Wet Paint Custom Daniel Smith Set, Wet Paint St. Paul | Permalink. Join us in a 12-week creative activity group where we explore techniques and mediums together in a Weekly Workout! All ages and levels of experience are welcome. Each Wednesday a new “workout” will be posted here that details a project for you to try and a materials list to reference. Each week as you complete the exercises, we hope you’ll post a picture of your finished workout for all to see. You can also take a look at what other folks have done and leave comments in a general forum. 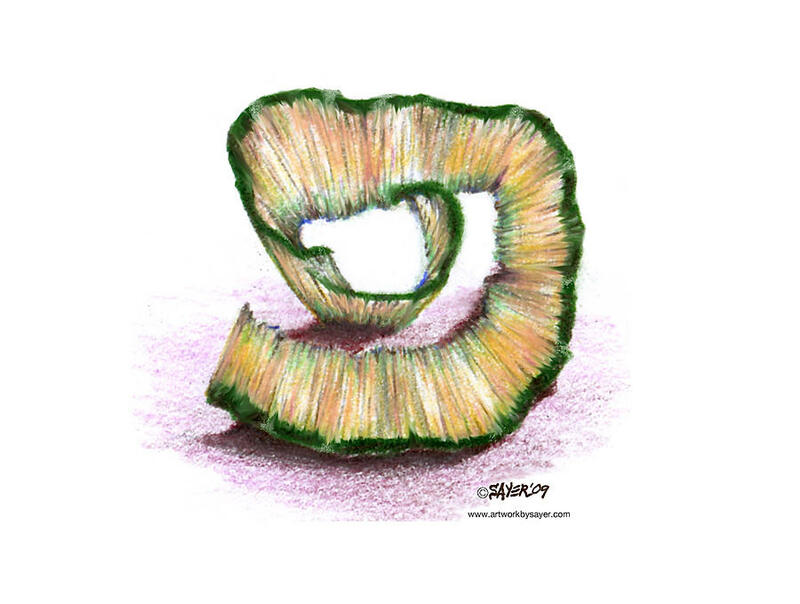 Grab your favorite sketchbook and let’s get to (art)work! Can you guess who our photo bomber is in the background? Your first assignment: select a sketchbook to use for your Workbook! We suggest getting a multi-media-friendly book to hold up to the variety of materials you will be using. Next, make it your own (like Liz did by embellishing the cover with pretty paper! )- nothing too fancy, just make it something you want to use. And, be sure to keep it accessible for when creativity strikes! Feel free to post pictures of your personalized Workbooks. We’ve got plenty of great sketchbooks to choose from at Wet Paint. For a limited time (2/19 thru 2/28) you can find several of our favorites for 20% off: the AquaBee Super Deluxe 808 in 9”x12”, the AquaBee Big Yellow Bee Co-Mo sketch in 9”x9” and Strathmore’s Visual Journal with Mixed Media surface in 9”x12”. Click on here to order online! Categories: Wet Paint Weekly Workouts | Tags: Liz Carlson, Weekly Workouts, Wet Paint St. Paul | Permalink. Nearly 30 years ago I met Gil. 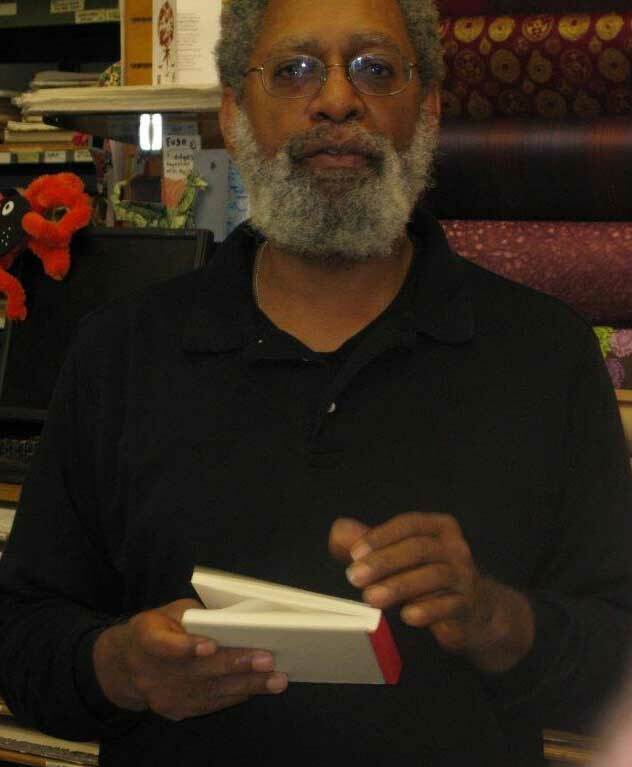 Gil was selling art supplies at a store in Berkeley. Next time I saw Gil, he owned an art supply store in Palo Alto. Both of us being independent art supply retailers meant we had a lot in common. What we didn’t have in common, we have in a friendly way, argued about over the years. Gil likes to travel and spends lots of time in Europe. And during those trips, he has found some great art supply lines that no one was importing into the United States. So we share our retailer woes together plus Wet Paint buys Gil’s Kunst & Papier books and Fibonacci brushes. Kunst & Papier is a German line of sketchbooks and journals. They were designed by an artist because he couldn’t find a sketchbook to meet his own needs. The Wet Paint staff heartily endorses this line through their own personal use of the product. All of the sketchbooks are made with beautiful, quality paper. They respond to a variety of media and of different artists’ touch very well. 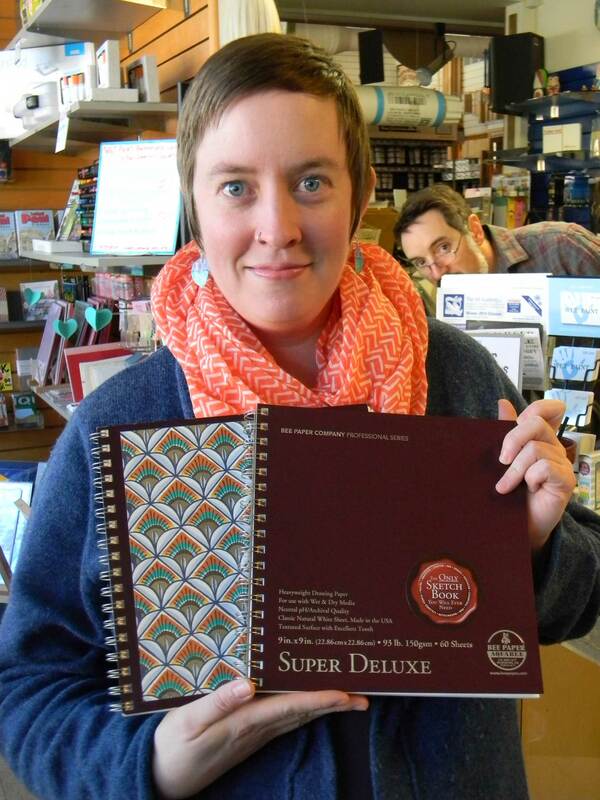 The binderboard sketchbooks are their signature line. With a highly flexible spine these books have a great lay flat quality. No more using the side of your palm to hold the rolling paper flat. With plain bookboard covers, they are plain and simple in appearance which then can become the substrate for the artist to personalize. Newbie at Wet Paint, Chris, likes the subdued appearance which you can “make your own without defacing the book.” Both Liz and Justin rely on Kunst & Papier because their books are so well made they “wear well” and hold up to hauling them around with you. Even K&P’s simplest soft-covered sketchbooks that have few sheets and staple binding meet the discerning eye of Virginia who applies a wide range of media to their pages. Everyone feels they are just the most esthetically pleasing line of books, to the eye and to the touch. They look good. They have a wide variety of sizes. They have great paper. They are well constructed. 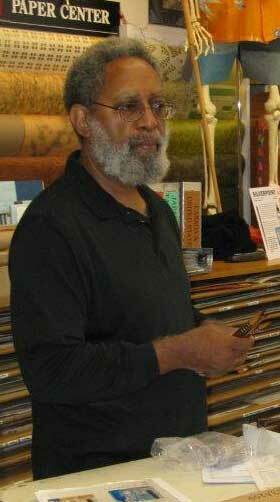 A few years back Gil visited Wet Paint with the Fibonacci line of brushes he found during his travels. The jaded Wet Paint staff, who have seen and tried just about every brush currently made, all wanted their own Fibonacci brushes. Beautifully crafted with synthetic blended heads in a vast assortment of sizes and shapes for water media. So what’s with another line of brushes? Liz likes the comfortable, well balanced handles. Verra likes the great snap of the hair. Justin likes the fact they hold their point for a very long time. Steve likes the crispness of the lines they make. Another esthetically pleasing, well-crafted tool. When you handle lots of art materials, you just know when you pick up the good ones. These are them. This weekend only, all Kunst & Papier sketchbooks and journals are 40% off MSRP and all Fibonacci brushes are 50% off MSRP! In-stock items only, valid 10/18 to 10/20/13. Categories: News | Tags: art supplies, Fibonacci Brushes, Journals, Justin Terlecki, Kunst & Papier, Liz Carlson, sketchbooks, Wet Paint St. Paul | Permalink.